Have you ever lost perspective and suddenly found it again? I did this week. I was having one of those days, when everything seemed to go wrong. I was cross and irritated, and settled down to see what my friends were up to on Facebook. Distracted, I scrolled through the posts, stopping suddenly when I saw this drawing by an eight year old girl. It’s the kind of drawing that any eight year old would draw. Except this girl was not asking for a Nintendo DS or a fun day out. All she wants is to be better. To be well. To be healthy. Aillidh is eight years old and seriously ill. As ill as a little girl can get. She has Acute Myeloid Leukaemia and is going through her third chemotherapy session. She desperately needs a bone marrow transplant. Her parents are appealing, through their Facebook page and elsewhere, to find a donor. Aillidh is a blend of white Scottish and Mestizo – the mix of European and indigenous N. American peoples (Native American/Indian). Her type is very hard to match so for this reason it is important that her story is shared throughout Europe and America. It is particularly difficult to find matches for mixed race patients. So, the more people who sign up to the Anthony Nolan stem cell register (or in the US Be The Match website), the better chance Aillidh has of finding a match. Myth: Donating blood stem cells is painful. Reality: People who have donated via the bone marrow method compared the after-effects to a hard game of football. Many donors find the experience fulfilling and for some, it’s life-changing. Donation can be done via surgery or a simple blood transfusion – the doctor of the recipient advises on this, but the final decision is made by the donor. So this week, I found my sense of perspective. 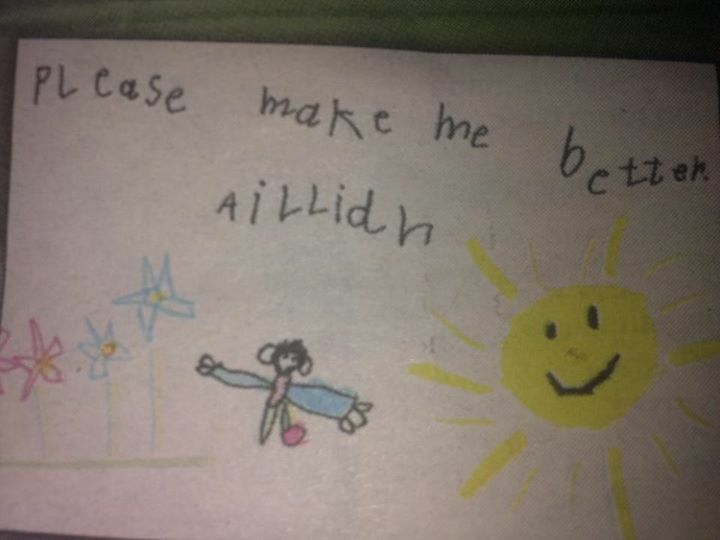 Nothing in my life is close to the horror that Aillidh’s parents are going through. This sense of perspective does not lessen my problems, they still exist after all, but they are manageable. I ask you to do the same. Sit down and count your blessings. If you are on Facebook, please *like* Aillidh’s page and pass it on to your friends. If you are on Twitter, pass it on. Email your friends and family, particularly those in the US and ask them to pass the FB page on. The more people sign up as a potential donor, the higher the chance is of finding a match for Aillidh or for one of the other Leukaemia sufferers around the world. In addition to this appeal, Charlie Brooker, of all people, has urged YouTubers to sign up to the Anthony Nolan Register. Click here to watch it.